I started writing this post a few months ago and now coming back to it, the truth is she is changing soooo fast cognitively that it’s absolutely useless to be writing a post about it. Things that impressed me yesterday are old news and now she’s doing something even better. So I’ll put down age next to each item as I write them down for reference. Obviously by this time she understands about 80% of everything we say (daily stuff) and 99% of everything we say to her. But then by the end of the day I can’t even remember all the things that happened. A while ago ( maybe at 12-13 months) she signed a sign for hurt for the first time. The kicker is that I had never signed it to her before. It was something Lexitwin’s mom signed to her daughter once in Alexis’ presence and I didn’t even see Lexi paying attention. It’s a pretty cool sign btw, especially for pre-verbal toddlers. Every time she’d fall, she would sign hurt instead of crying. Crying is a form of asking for attention, so the signing worked even better. I also love it when she drinks from the tap in the bath like mommy. Or better: fills her palms with water and then tries to give that water to me. Or my favorite: after having drunk some water from the tap while we are hanging out in the bathtub, I ask her to give mommy some water, expecting her to fill her palms with it and bring it to my mouth. Instead, the silly girl bends down, fills her mouth with water and then puts her mouth on my mouth and tries to give me water that way. I almost fell out of the tub from laughing. Role playing started about at this age and has progressed with each month to add sounds and interactions with stuffed animals, for example when making imaginary tea. 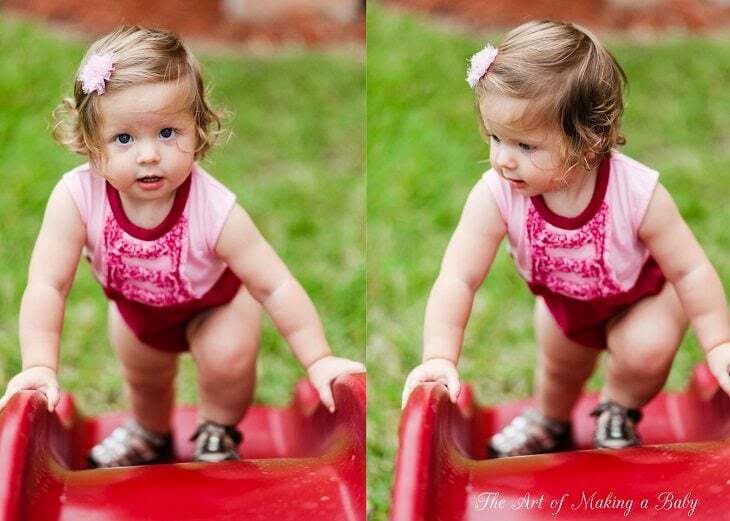 At 13 months we introduced the potty and she had great success pooping (100%) and peeing (60%) it it for a week. Then the newness wore off and she pushed back, so I backed off. 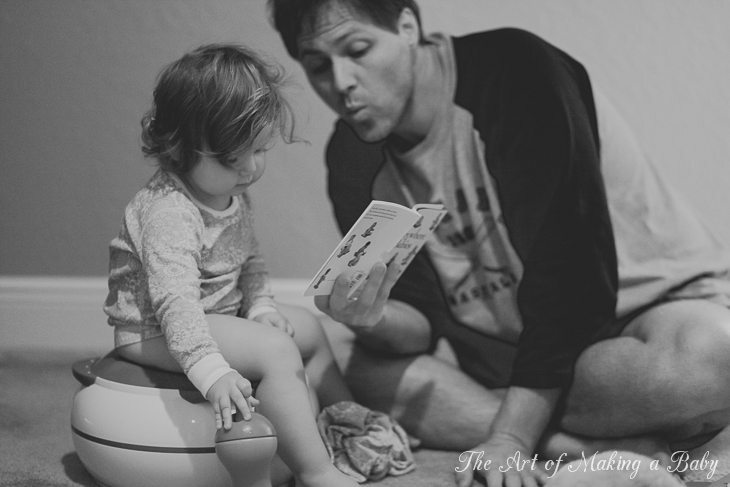 At 18 months now we are back on with the interest in potty training on her own, but that’s another post for another day. Her memory is amazing. She remembers what she put and where from days ago, even if she placed it into a box in a room at the opposite side of the house. She starts to walk away and I follow her thinking she moved on. Except for, she leads me to her bedroom where apparently she had “stashed” the toilet paper holder thingy sometime in the last few days. We have 5 bathrooms, so we didn’t know it was missing for a day or so since we were apparently using other bathrooms. It absolutely blew my mind that 1. she knew what I was talking about 2. that toilet paper couldn’t be put onto the holder without the springy holder thing, 3. she knew where the holder was. So needless to say there have been numerous occasions where I’ve been absolutely blown by her level of understanding and her memory. It takes one event, one time for her to see/hear something to be able to recall it. Knowing where nesting dolls are in our neighbor’s house after sort of seeing them once and going there confidently with a goal in mind. That’s just too funny. Speaking of laughing, it’s still pretty hard to get a smile from her, but we have a development of sly smiles. OMG they are the cutest thing in the world. When she’s pleased with something, she will give me this sly smile, like she’s happy but she’s trying not to show it. Ah! And here we go again, things changed literally a week after I wrote this. She has now figured out the art of “fake laughing” or laughing on command, so she goes crazy laughing when she’s having fun or just when she WANTS to have fun. Also when she’s showing off in front of people. It’s really funny!!! I am going to try to videotape it soon, as well. She’s long since figured out some of our routines, like that daddy puts his hat on before walking outside if he hasn’t taken a shower yet. So if she wants to go outside, she’ll do the following steps: ask daddy to pick her up, tap on his head and her head indicating the need for a hat, when the hat is on, she will motion towards the door. Her shape sorter has been mastered for a while now, but she has a very interesting way of doing it sometimes. She will often “pretend put” the shape she is holding into the wrong hole while watching for my reaction and waiting for me to say “Noooo, a square doesn’t go into the circle hole!” Then she will proceed “trying” it into every hole until there are no more holes but the right one. Now the thing is I know for a fact she knows the right one and she often even reaches for it automatically until she remembers that she wants to play the “wrong hole” game. She shows this pattern of trying every answer that she knows is wrong before going to the last right one in a lot of different games and I find that very peculiar. She won’t always do it, sometimes she is in the mood to just answer it the right way immediately, but I still see that pattern once in a while. Iphone pro at this point. She’s always been fascinated with the iPhone because we use it so much and we have been allowing her to interact with certain apps that I deemed appropriate and educational. She quickly picked up what each button and icon does and has been able to freely navigate it on her own, including going to YouTube channels, turning on and reading e-books on auto-play,watching animal video apps, language apps. Starting from 15 months, all we would need to do is hand her the phone and she would navigate and turn on whatever she feels like at the moment. My favorite is when she would navigate to her e-book folder, turn on one of the book, select auto-play out of the three options presented, click arrow button when tired of the book, navigate back to the bookshelf, scroll to the side to find the next book, turn it on, flip pages if the book has no auto play function. Whoa! That’s a lot for a 15 months old. 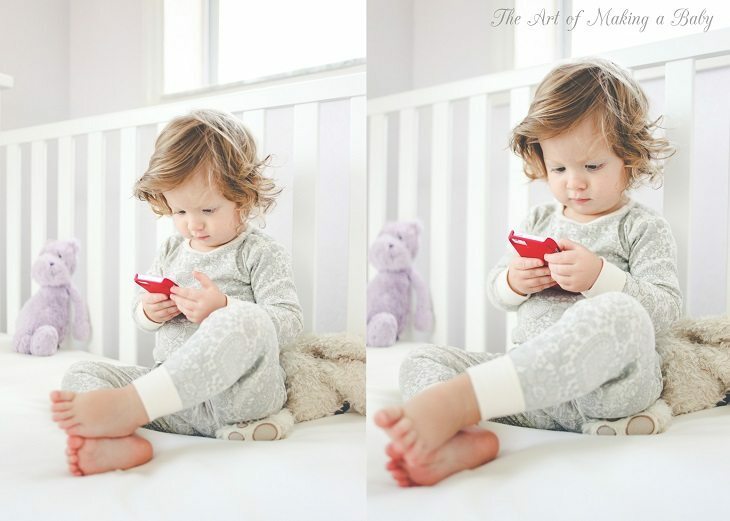 Recently ( at 17 months), Andrew switched to an Android and she just as quickly picked up on how to navigate his phone: swipe, hit the app button, go to her favorite app. She can put her shoes on and fasten them (with velcroes) and can ALMOST put her bottoms on. She adores wearing jewelry and putting on new clothes on, running to the mirror and literally twirling in front of it smiling at herself. She gets so proud of herself when she wears something cute and we gush over her. 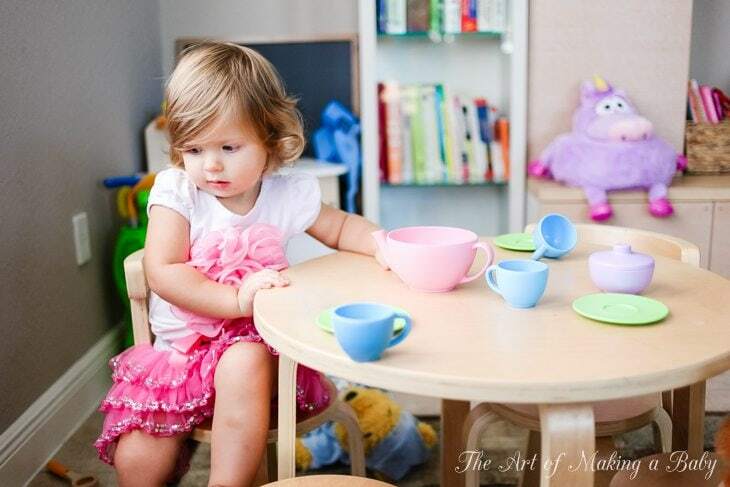 She loves playing tea time and making us food and then pouring us tea. She always makes this funny sipping sound when she pours anything into a tea cup or a bowl. Often you’ll find her pouring lots of toy oilve oil into a bowl without running water sound (SSSssshhhhhh!!!) and then shaking some pretend pepper into it before stirring it all together. So cute. The concept of a toddler bed was introduced at that age with really good success. She would point and happily crawl into her toddler bed that is currently in a sidecar position to our mattress on the floor where we co-sleep. She often ends up in our bed towards the morning, but likes to start off in her toddler bed. However, sleeping in her own bed has not influenced her sleep patterns for a second. She has begun displaying more frustration at events that she doesn’t like, however no tantrums so far. She cries, of course, but mostly when tired or hungry and never uncontrollable, for which I am grateful. She has been showing a lot of interest in boys and men. She will flirt with some men and be scared of others (usually with facial hair and those who don’t smile back). But when she sees a little boy, she get giddy. It’s hilarious to see. 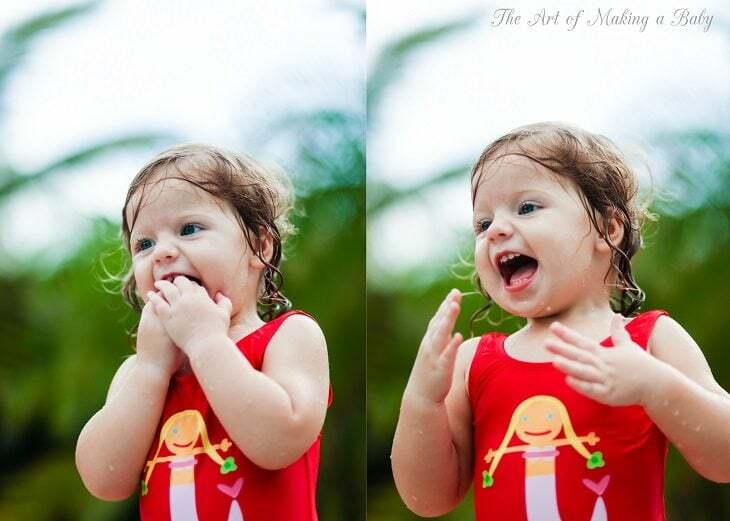 She will run in place in excitement and fake laugh while covering her mouth. I am not sure where she got all these gestures from but they are so funny to watch. She follows directions pretty well, unless she is busy and is not interested in what I am telling her. When she is paying attention, she will follow exactly what I tell her without protesting. Even her most favorite things like the Iphone or crayons or drumsticks ( yes, those are her three favorites) will be handed to me willingly if I ask nicely. She learned the concept of baseball glove and ball and has been walking around with her little glove on her hand, throwing the ball in and taking it out like a pro. The same happened with the golf clubs, she often runs to me with a club, hands me the ball, points to an exact spot on the floor where I am supposed to put the ball, and then attempts to hit it with the club ( she has about 60-70% success rate). There are plenty more going on of course, every day brings something new, like getting obsessed with stickers, or drawing like a mad woman and actually asking to be sat down for a longer period of time to draw or move crayons from box to box. She often likes to see what we say no to. Since crayons are some of her favorite toys, she will be walking around with one (knowing full well that she isn’t allowed to draw anywhere else besides paper), and touching it to different surfaces waiting for me to say “No, sweetie, you should only draw on paper”, and then proceeding to put it on another surface without taking her eyes off of me, waiting to hear the same sentence. She can do it many many times in a row until the game gets old. These two are from the physical development, but I needed to write them down before I forget. I am thinking about resuming monthly updates, since too much happens each much and it all is easy to forget. She is really close to swimming on her own. I am too afraid to let her go but she works her legs and arms and swims like a little fishy with only half the support from me. At her gym class she has shown great aptitude in coordination and gymnastic ability: climbing, tumbling, hanging off the bar (she even attempts pull ups) and walking on the balance beam, so once she turns 2, I’d like to send her to a gymnastics class and she if she likes rolling around there. Finally, there are 3 semi-recent things I’d like to include that sort of blew my mind. (Age reference: 18 months) Since she isn’t a huge talker (on target according to our recent check up, but not way ahead of the crowd or anything), sometimes it’s hard to judge how much she really knows or what she thinks. About 2 weeks ago I discovered that she knows both the Russian and American alphabet. We weren’t focusing on letters since she didn’t seem to show much interest in them a few months ago, so I wasn’t specifically pointing out letters or asking her what they were unless she did it herself. A few weeks ago, I asked her where a certain letter was when we were looking at some flashcards,fully expecting to have to answer my own question for her, when she reached out and pointed it to me. Curious, I asked her to show me another letter and she found it. We went on and on like this and she pretty much got every letter right (she has more trouble with the last letters of the alphabet due to less frequent exposure). So then I pulled out our Russian alphabet app and put a quiz game on and she got every letter right, except for a few random ones. Mind officially blown. Again. Yesterday, she walked up to me from the back and spelled out ROXY written on my back (“AAAAAAAARRRR” “OOOOOOOOOOUUUUU” “SSSSSSSSSSSS”), she can’t pronounce X well so she does SSSSSSSS. Obviously, Y still eludes her. So that makes it ROXY as the first almost read/spelled word ever! How cool! I know she learned this from her iPhone songs and games and her Alphaberry and this is something I will definitely be writing about and will be happy to recommend the apps, toys and flashcards Lexi has been using to learn the alphabet on her own. (Age reference: 17 months) The second thing that impressed me was her understanding of and skills at the memory games. We have a Russian memory game on the iPhone ( there are English versions too), where you are supposed to open 2 cards at a time and find a match. She finishes these in no time, progresses to next level and claps when the level is complete. She completely understands the concept of the game and what she is supposed to do. She can’t strategize well yet, but definitely remembers where the animal she is looking to match was and goes for it until she has completed the board. And finally, my most favorite recent thing ( 17 Months) is acting out songs. She acts out and dances to Wheels on the bus and Itsy Bitsy spider, Happy and you know it and When we wake up in the morning. I can never get the camera in time to record these things well, but I did catch one little moment while at the pool. Obviously, she just turned 18 months and there are going to be a ton of changes this month alone, but I couldn’t wait any longer to write it all down and post. Three of my four children are girls, and each of them have ‘flirted’ with non bearded men from toddlerhood. When you do your best to NOT objectify th as flirts, it’s a little disheartening! Great post! Can’t wait for your app post. Looking forward to it! Will definitely do! There are some good ones.! Love reading about Lexi’s development! I was wondering what type of cloth diapers you guys ended up going with. I did a search for “cloth diapers” but the last update I could find was 6-7 months, when you mentioned you were trying to decide between BumGenius and Flips. I’m a few weeks out from having our first, and set on cloth diapering. I’m definitely leaning toward BumGenuis (the elementals and freetimes – pockets seem like an extra step! ), but wondering if you guys went with Flips and like them. cute! I noticed you are speaking to Lexi in English. What happened to One Parent One Language? Since we do a lot of english songs and books, it’s virtually impossible. I usually switch to english when we are singing english songs or reading english books or talking to daddy. Find the “morning song”, she will love it. Lots of fun words to gesture to. Wow a lot happened indeed! She evolves so quickly. I found the leap frog letters factory in french for Ryan but I’m interested to hear about the different app you use as well. I may buy the alphaberry at some point, i’m addicted to b toys! Do you mind sharing with us a few apps you use as i don’t see them in your next planned posts. Cheers! I’ll add that post in the planned. First of all I’d check out oceanhouse media e-books, those are amazing. I will go over the rest asap. Interesting post! 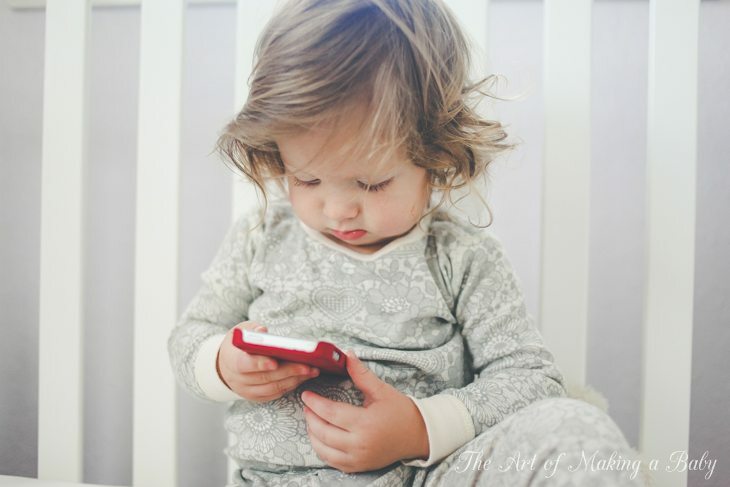 What are you thoughts on limiting screen time for children under 2? AAP explicitly states that “television and other entertainment media should be avoided for infants and children under age 2. A child’s brain develops rapidly during these first years, and young children learn best by interacting with people, not screens. (end quote)” I am concerned that screen time/interaction with the iphone/ipad/PCs may a)promote less interpersonal communication between me and my children and I noticed that my munchkin learns the best by interacting with us, both in terms of vocabulary development and development of good habits/life skills. Plus I do not see her all day, I definitely what us to spend time together 🙂 b) somehow contribute to possible development of attention disorders – I have absolutely no study to quote but … I feel that TV and other media provide instant gratification and rapidly changing content and do not allow children to learn to concentrate, control their impulses and be patient. I have not exposed my daughter to any TV, and computer time is limited to Skype calls with relatives abroad, usually on a weekly basis. Are you at all concerned with Lexi’s iphone screen time, even with the “curated” apps? Sometimes i wonder if in this day and age we can not escape the “screen” for ever, and if I am doing a disservice to my child by limiting her exposure to “the technology” of the future…. but then again – there is going to be plenty of time for them to learn how to use the iphone, why not teach them to interact with humans and occupy themselves with toys and books and non-techy play, while they are still captive audience and are willing to try these things…? It would be a really long answer to be honest, so I’ll reserve it for the post about media. But (i’m pretty sure we’ve already touched on that) while I am generally against TV/cartoons for the under 2 year old crowd and older, I now see the value in certain electronic apps. I can totally see how for a working mom you’d want to maximize your interaction with your child. But when you’re literally spending every second with your baby, she gets amazing amounts of human interaction and often wants to just relax and read an e-book, or play a memory game, or a spelling word game or watch a video of a drummer or act out and listen to a song . There are two rules I have for the iphone media (which is the only thing she is exposed to): No fast screen changes, and limited time at the iphone. It works on many levels and I was more than amazed at HOW MUCH she learned from the iphone vs human interaction. I was very much against media, but now I see that different types of media CAN be beneficial. I now get that the AAP statement is simply a blanket statement to encourage parents who otherwise would put their kid in front of a TV to spend more time with them. When parental interaction isn’t an issue, the statement is null. Especially if parents actually sit down with the kid and narrate what is going on in an age appropriate media. AAP didn’t even mention the effect of the fast changing scenes, because it’s more effective to just say “You can’t do something at all” than to say” Well, you can do this, if this condition is satisfied, and this if you have this”. And finally I think it comes down to an individual kid and how they enjoy learning. Obviously, since Alexis seemed to have picked up many behaviors and much knowledge from the apps she uses vs our play, it works for her. Honestly, she is a bit like me in that respect. I cannot stand being “taught” something in class or in person. I want to sit down with the book, on my own and do my own thing. I learn much more effectively when I can just do it myself. Like I said, i will post a super detailed post on studies I’ve read about, things I am doing and why I am doing that. As far as what YOU are doing with your toddler, if it works for your family, then who cares. If I didn’t see Lexi all day, I would throw out any distraction out of the window so that we could spend time together. And i totally wouldn’t worry about “doing her a disservice” but not exposing her to technology. She will learn it easily when she is older. There’s absolutely no need for a toddler to use technology unless they benefit from it and learn from it, like Lexi seems to. Spend time with your kid and enjoy it if that’s what works. The only thing that drives me bizerk about this technology take over is that kids can’t self entertain anymore. When we go to the store or a restaurant we always get complemented on how well behaved our brood is and I think it’s because we don’t distract them so they have had to learn to talk with us and color, pick up letters, words, numbers, colors, shapes from the world around them (cereal boxes, aisle numbers). It certainly hasn’t limited them as my two older were proficient readers by 4 and our babiest baby is well on his way. I think there is definitely a happy medium somewhere. I don’t think letting a child play educational apps or toddler song apps on an iphone for 30 min is better than letting a kidwatch 30 min of Dora while you take a shower. I guess I just don’t get what the rush is. You say she learns faster from an iPhone than from human interaction, but why the need for her development to be boosted in this manner? As you say, plenty of time for her to learn these skills later, and most of the things you mention she is learning will be much more meaningful when she is more cognitively advanced and can contextualize AND generalise them, which she won’t be able to do at present, so apart from entertainment purposes, there’s very little value in them. Also, surely you can think of other things to do with Lexi for relaxation other than hand her a device? I can understand that she needs some down time, but in actual fact it’s only her body that is relaxing when she is using a device, not her brain, which is one of the reasons their use is not recommended for littlies (I can cite some studies if you like) as at this age children are not very good at self-regulating, and the device will be sabotaging the development of this skill. As for learning independently, have you read about Vygotsky and his ZPD theory in your travels? You might find it interesting in relation to your comments about Lexi not wanting to be “taught”. There IS NO rush. I allow her to use the phone not because I am looking for her to learn something. In fact until last week I didn’t know that she WOULD learn much from it. It’s something she likes playing with and I feel comfortable with the apps and e-books that she is using. You say “apart from entertainment purposes, there’s very little value in them” and last year I would have agreed, but not anymore. I never said she learns faster from the iphone, in fact I don’t know exactly HOW MUCh she is retaining from the iphone vs our interaction, I see it more as a supplement TO our interaction. Like any toy or book. But even with that said, the fact still remains that she learned the whole Russian alphabet, both sounds and letter names from the apps alone (and my interaction with her and the apps). That’s something that I wasn’t able to do as effectively in play since she is not exposed to the russian alphabet in that manner. Not only can she recognize the letters now, correctly identify them (she aces the app quiz) but she has fun doing it. 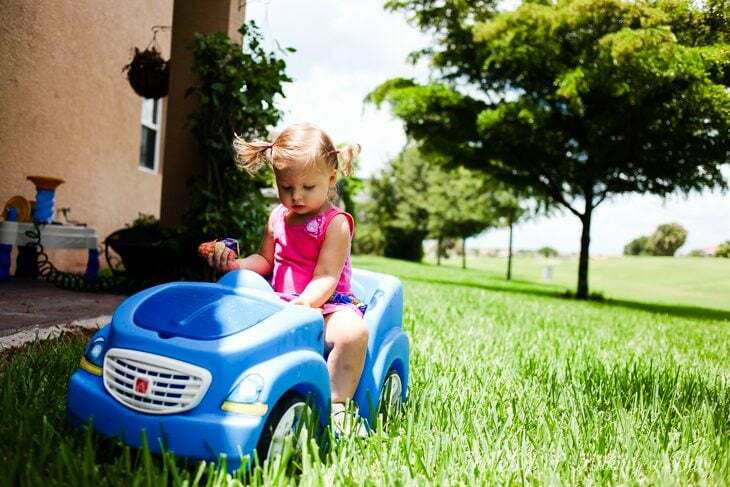 It’s something that is interesting to her and that’s how children learn- through play. Therefore I don’t see it any different than any other activity that I do with her. We play with a toy, I read her a book, we draw, we sit down together with the iphone and she goes through Russian alphabet, plays the matching game with me or reads a Dr Seuss ebook while I make her food. The phone gives her more exposure to Russian than I otherwise wouldn’t be able to give her, either due to lack or time or materials or both. You say it somehow would impact her ability to relax her brain, which I disagree with. The phone doesn’t replace her nap time, or bedtime, which is WHEN she relaxes both her brain and body. If there was no phone, she would run around all day and play and read just the same way she does now, without any “downtime”. These are toddlers we are talking about, they are non-stop. And also because we ARE talking about toddlers, you can’t use the the phrase “Lexi not wanting to be “taught””. You should know perfectly well that at this age, they ARE NOT taught. They learn through play, first and foremost. Not through drills and teaching. And child’s play should always be child-directed, not parent directed. I am sure you know that too. In reference to her using the statement “Lexi not wanting to be ‘taught’ ” I think she got that from your statement of Lexi being like you, and you don’t like being “taught”. But that’s just what I got out of it. Oh yeah I know WHERE she got it from, but it’s not necessarily what I said. It was just how SHE read it. As in, “Lexi learned something from the apps, so it looks like it’s effective. Which is probably like me.” And then I go on to explain that I don’t like being taught and learn better on my own. I don’t think people really care that Lexi plays with the iPhone, I think it’s just a reaction to you saying that she doesn’t get screen time. I’m sure your post will clear it up!! I keep seeing this study that say light exposure from electronics suppresses the production of melatonin. I have a toddler that sleeps very iffy and when I read that I took away all electronics ALL day and his sleep is much much better. I thought that might help since Lexi wakes up so much at night. I hope it helps you!! Not sure where you read that she gets no screen time. That’s hasn’t been true for a while. She gets no TV time and that’s what I’ve been saying if asked. But an iPhone has been in play for quite a few months now. I think people may be confused because you had originally stated you weren’t planning on using anything for screen time (tv or iPhone/iPad etc) but now are using the phone. I know you’ve mentioned quite a few times that you use it so I’m not sure why people are still so confused. Especially since you stated ABOVE that while you weren’t planning on using it, you changed your mind (I think that’s allowed, people). That was like years ago lol 🙂 I am not sure if i even had the iphone in mind when I was thinking no screen time. I know I was specifically thinking movies and shows. Don’t know why it’s so confusing to people that as Lexi grows and develops, I would adjust certain things as I learn as well. Ok seriously people?! Are you telling me that every single thing you ever said you would never do or do as a parent you never went back on or changed. Who freaking cares if she said that or not. Is her child fed, well loved, and taken care of? Yes. So what is it to you if she plays on an iPhone. You’re the parent of the year because you followed a study about an over diagnosed illness and it’s possible cause? There are lots of studies out there. Do you not vaccinate because hey you saw a “study” I think as parents we can make choices for our own families and what works best. My daughter has learned lots of things from us and her apps. She can sit in a restaurant without electronics. She sounds very much like Lexi as far as development when she was that age. Cognitively very smart. So if their brains can absorb and learn fast in those specific areas who cares where it’s coming from. Least of all you who isn’t her parent. Lexi is just beautiful! I love her pictures! Honestly, based on your posts and your pictures, it is apparent that you are doing an amazing job as a parent. IMO – I think people love to critique that which they don’t agree with. Not that you were doubting yourself, but I think you seem like a really great mom! I would so appreciate if you may share your favorite apps Lexi using now. You and your family seem great. Please be aware mobile phones and all wireless devices give off microwave radiation which is really harmful for babies/children/foetuses. 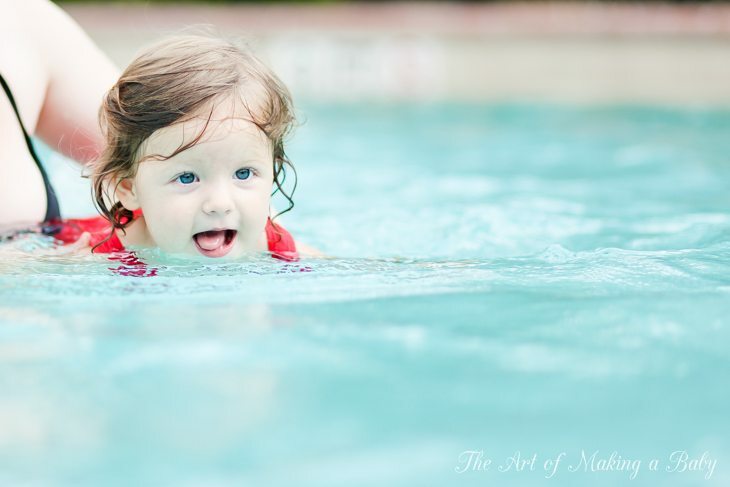 Children and babies absorb much more waves than adults because their skulls are thinner.